A Shift in Perspective views the same conversation from two different mindsets: the romantic and the logical. One side of the book imagines idyllic encapsulated visions and promises, the other side refutes this fantasy with analytical diagrams. Written and designed by Macy Chadwick, A Shift in Perspective was printed from laser-cut plexiglass intaglio plates and polymer plates on Gampi Shi and Kitakata papers. Dos a dos binding in a printed paper cover. This book is one of a set of five books created by the members of the collective, Shift-lab: Katie Baldwin, Denise Bookwalter, Sarah Bryant, Macy Chadwick and Tricia Treacy. 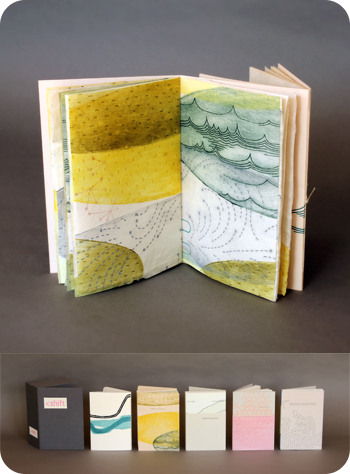 Each artist created a small book of identical dimensions to reflect a shift in perspective. They were displayed together at the San Francisco Center for the Book in 2014. The books are sold only as a set of 5 books in a slipcase box with magnetic closure.